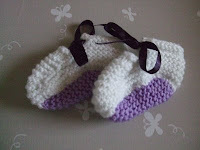 These pretty bootees are knitted from oddments of Baby DK wool using 11mm (size 3) needles. You will also need approx 40 cm of ribbon to finish. You can use any number of colours; those shown have had the soles 26 rows knitted in an alternative colour.